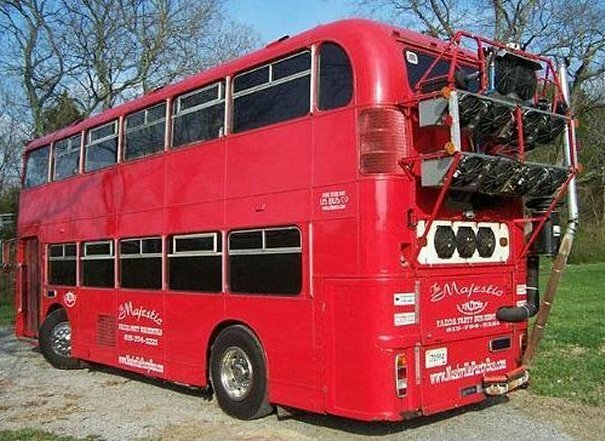 This page is occasionally updated with links to other pages on the website covering interesting and unusual vehicle uses and conversions. 816SHW fitted with a "balcony"
The original 1956 body of Crosville DLG797 (XFM208) was destroyed by fire at Rock Ferry. It was rebodied by ECW in 1966 using the original LD jigs but with contemporary features such as no beading for the upper-deck cream band. 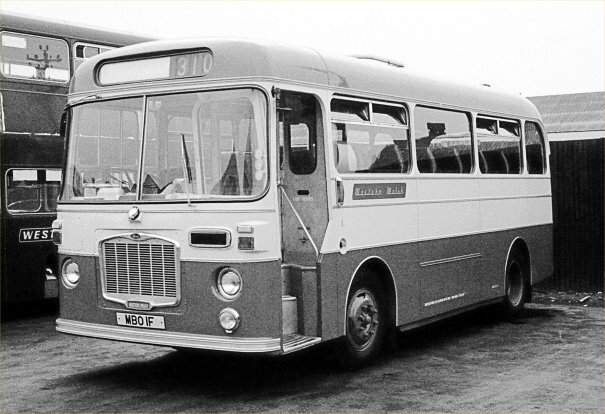 This Lodekka remained unique but led an ordinary life until withdrawal and sale for scrap in 1978. 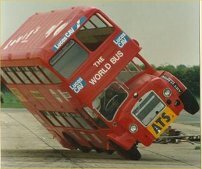 This is former Eastern National 2401 (XVX26) undergoing an attempt to break the world record for driving a double decker bus on two wheels! 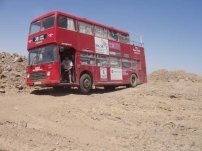 The bus remained under control for only a short distance before falling back onto four wheels, but it was an interesting use at the end of its life. 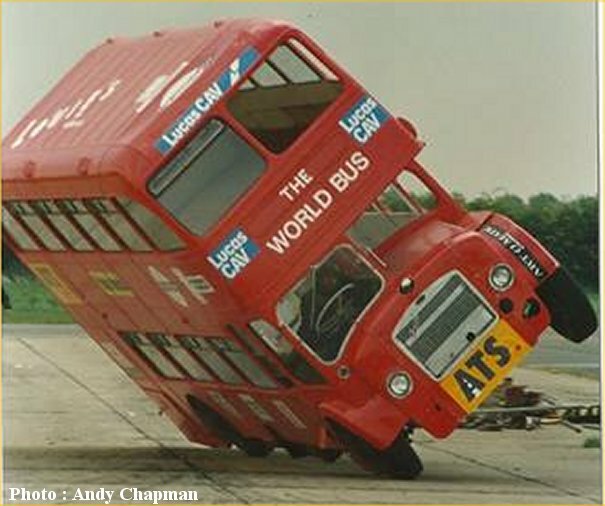 Immediately prior to this is had been used as a promotional vehicle for The World Bus, a world tour undertaken by 431FHW, departing from Liverpool in November 1988 and returning in December 1989 without any major mechanical issues! 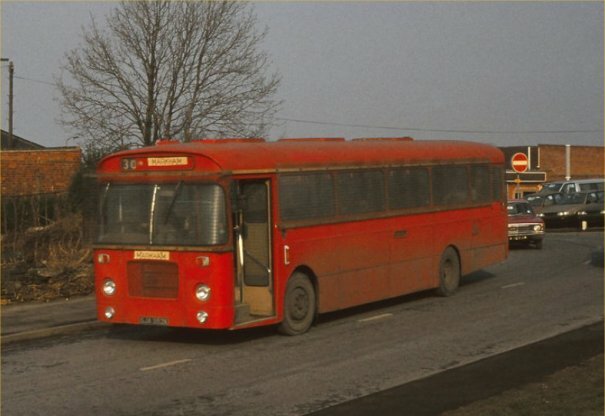 SRB66F and SRB67F, seen here together in 1972, were a unique pair, the only two ECW-bodied RESH chassis to be constructed. 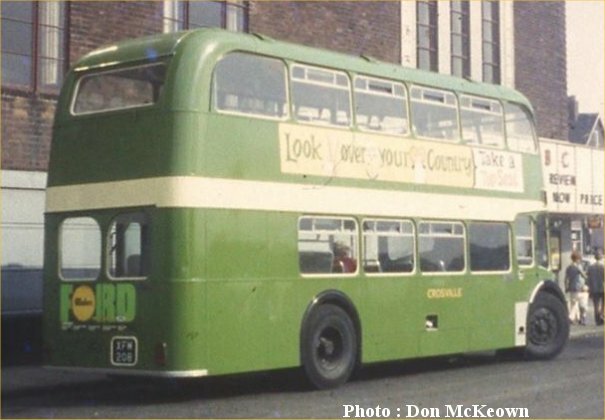 The RESH was the Short High version of the RE and was intended to fill the "small coach" niche, but this role was in fact taken up by the LH family, presumably due to the preference for lightweight chassis amongst independent coach operators. 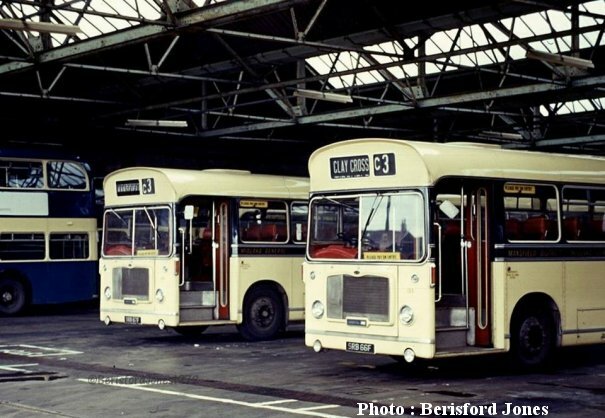 Once again Bristol was ahead of its time, the market for heavyweight coaches not really taking off until the 1980s, by which time of course it was too late for the Bristol factory which Leyland snuffed out in 1983. 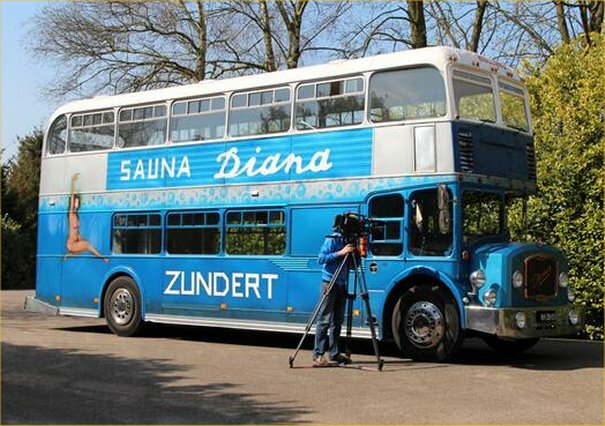 Only 11 RESH were built, the other 9 all carrying Duple bodywork. 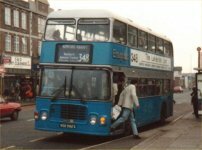 New to Midland General with 43 dual-purpose seats, the ECW pair both passed to Trent in 1976 and were later demoted to bus livery (retaining their DP seats) but were sadly scrapped once they became time-expired. 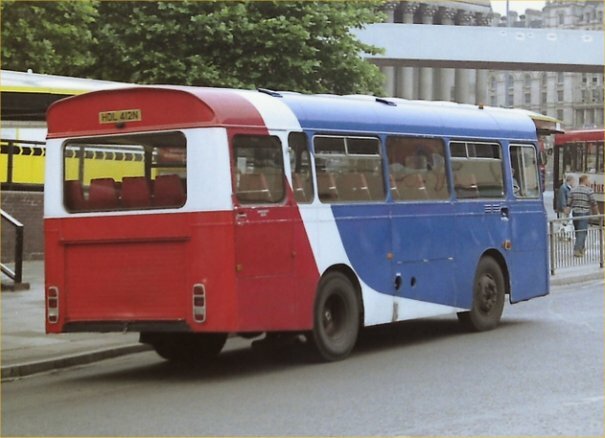 Duple-bodied LHs were rare enough as coaches, but only three were built with Dominant-style bus bodywork - a pair with Silcox of Pembroke Dock and KBX38P with Davies of Pencader. It was obviously a robust design as it lasted a decade with each of its first two owners (Nuttall of Modbury was its second owner). It finished its days with Tally Ho! where it looks anything but 20+ years old. 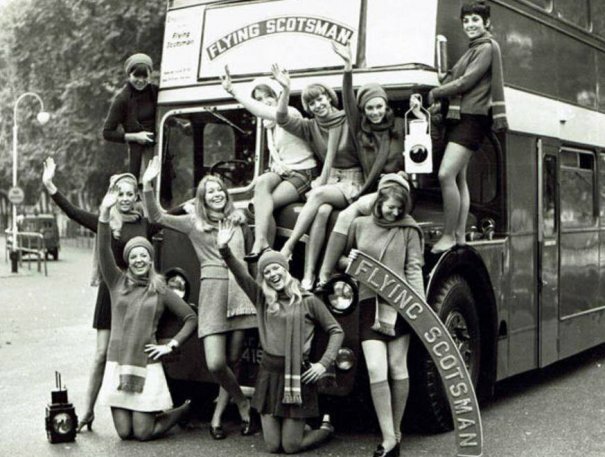 In September 1969 The Flying Scotsman was shipped to Boston, Massachusetts, U.S.A. from where it undertook a tour of North America. 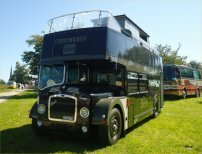 Two ex-Crosville Lodekkas (RFM410 and RFM415) were acquired by a company involved in promoting the tour, London Stateside Ltd. and were converted with offside entrances and modified to act as merchandise sales vehicles to accompany the locomotive. 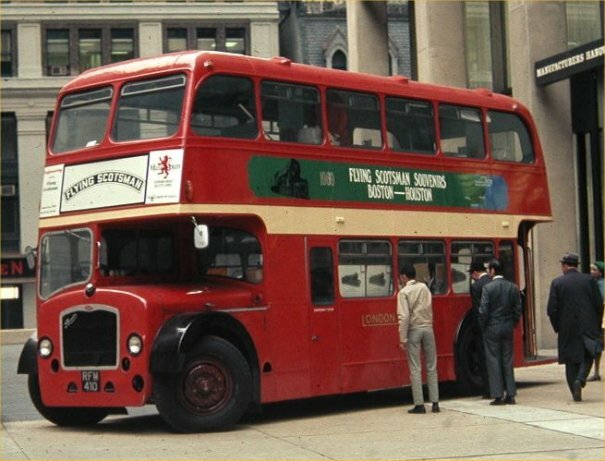 This photo shows RFM415 undergoing promotional work in London in September 1969 prior to being shipped. 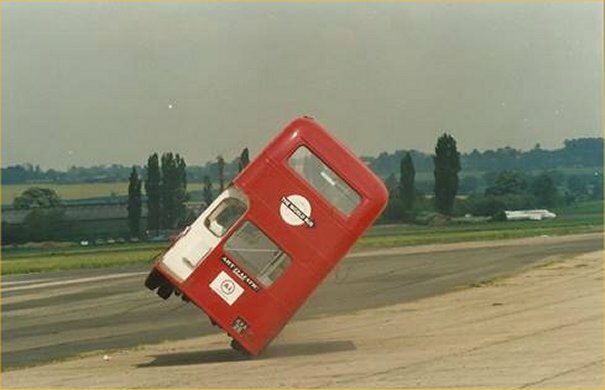 Very unusual was the rebuilding of early Bristol Omnibus RELLs from single to dual-door configuration. Alan O Watkins was able to capture this view of 1077 (OHU772F) actually undergoing surgery. This was the pilot rebuild which was fitted with a level floor, but the remaining conversions retained their ramped floors. A total of 20 conversions were completed, consisting of the entire Cheltenham District (8) and Gloucester City (8) allocations plus half of the Bath Electric Tramways allocation (3) and one from Bath Tramways. 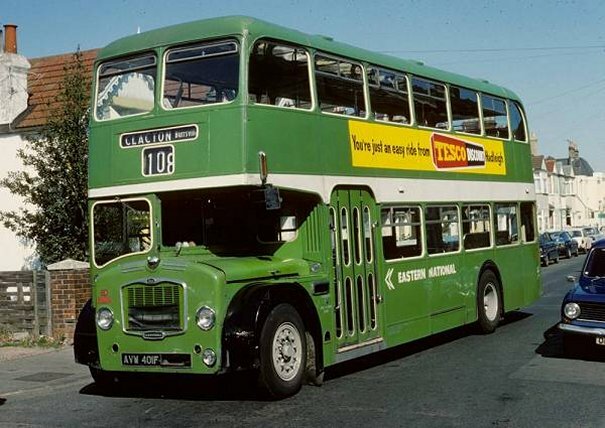 The Gloucester buses were part of the main Bristol fleet and were fleetnumbers G1044-6/55 and G1072-5. During the miners' strike of 1984/5 a number of vehicles were fitted with armour over the windows to transport workers willing to cross the picket lines. I have 13 LHs listed as having been used by the National Coal Board but until this photo of SJA352K appeared (courtesy of Guy Alertse) I had no idea that any REs had been involved. Guy took this photo in February 1985 at Brimington (near Chesterfield) with Markham (the colliery) in paper on the destination and front dash. 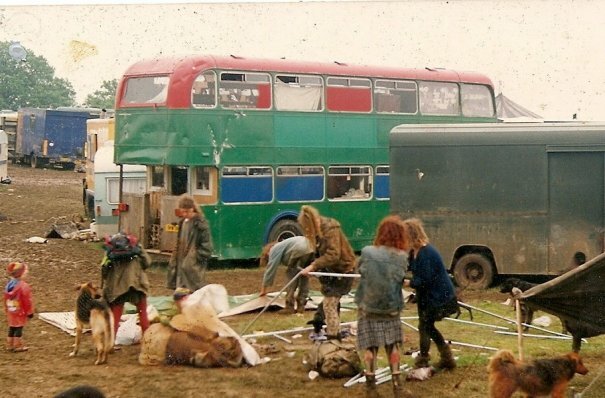 The bus was still with Trent at the time although naturally (given the political tensions at the time) all visible signs of its ownership had been removed. It survived to be returned to normal service and after a lengthy spell with independent operators has now been beautifully restored by Steve Thorpe and team. Information which came to light following the publication of the above photo indicates that at least a further four REs were being prepared for use at Pleasley Vale when they were firebombed and destroyed, an indication of just how divisive the strike became. 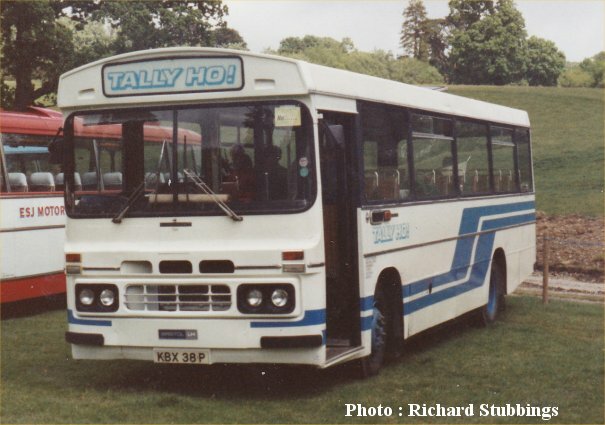 At first glance Greenslades 316 (AAX259J) is a perfectly normal coach in National white livery photographed by Dave Mant at Salisbury in April 1975. 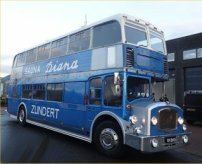 However this was unique as the only LHL ever to have been owned by the National Bus Company! 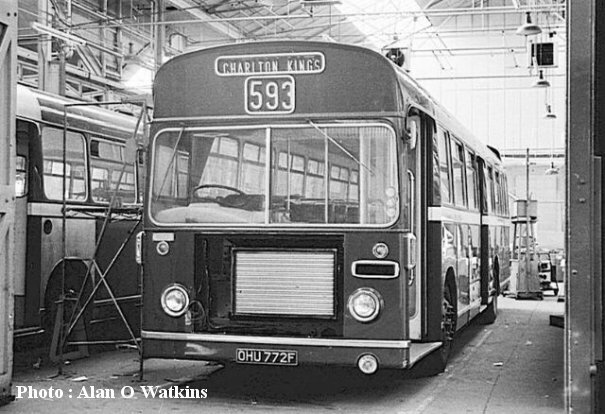 It was new to Hills of Tredegar in 1971 and came to Greenslades in 1974 via Venner of Minehead. The reason it was acquired is unclear but it didn't last too long, passing back into independent hands in 1977 when Devonways Travel took it on. "I was Area Engineer Cleveland from 1986 to 1988. I tried to tell the United hierarchy that long distance RE coaches were totally unsuitable for this contract. They had very narrow front brakes, mechanical handbrakes, and a reputation for smashing brake drums due to heat when braking ( and this was on North East to London work). I spent many an embarrassing time at Fylingdales changing vehicles over and trying to effect repairs locally. The drivers, which were all employed by Fylingdales and not United, hated the REs after the lovely Hardwicks Leopards that they had been used to and therefore didn't treat the REs very well. On the steep hills that had to be negotiated they should have driven slower in lower gears but this was not in UAS control therefore the brakes were never in good adjustment for long. Also Leopards had automatic brake adjusters whereas REs had very old fashioned manual adjusters which required the use of a pit to make adjustments. It was never ending. We also struggled to get engineers to Fylingdales because we always had more than enough work keeping the stage carriage fleet running. From recollection, the number of workers using the contract was diminishing and this added to United losing the contract." 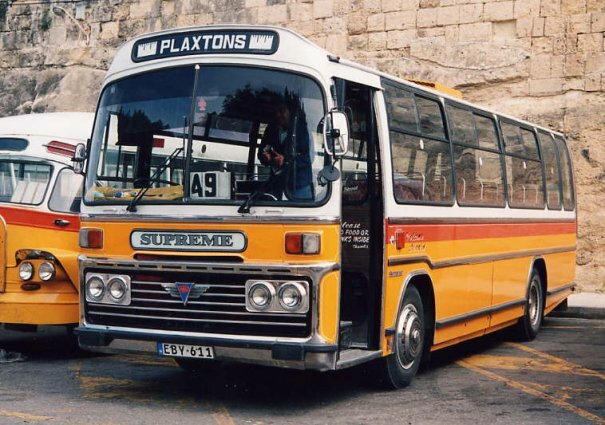 Most of the LHs that were exported to Malta in the 1980s for use on the famous Malta Bus Route network would qualify as "unusual" but this Plaxton-bodied one takes the biscuit. 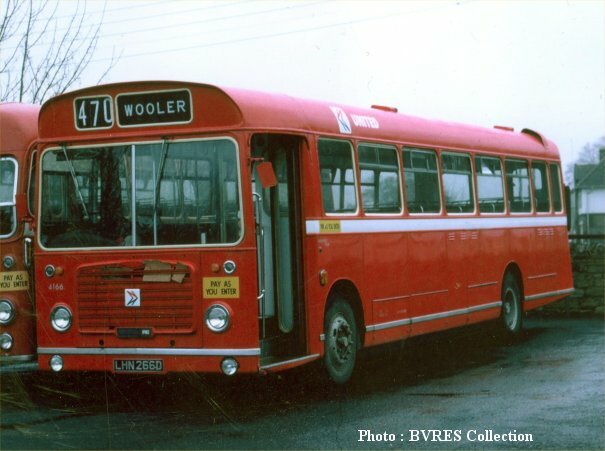 New to Silcox of Pembroke Dock as RDE298S it became Y-0611 in 1986, then EBY611 as seen here when the system of registrations changed. Unhappy with the Leyland O401 engine it carried the Maltese owner uniquely (for an LH) fitted an AEC505 unit plus 6 speed AEC gearbox, AEC axles and uprated braokes which must have made it the ultimate LH on the road. The story didn't end there though. Parts for AEC engines in general eventually dried up and towards the end of its career in Malta it received yet another make, this time a DAF DNS620 from a truck which was in fact a rebadged Cummins B unit. 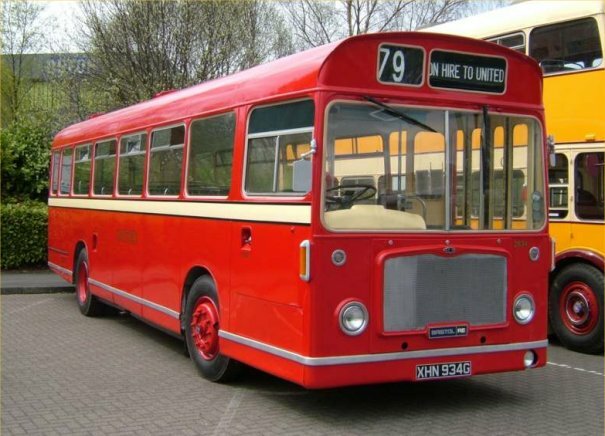 In a final twist it survived the 2011 cull when all of the old vehicles were withdrawn at a stroke and replaced with a brand new fleet of King Long buses, being stored by Heritage Malta and eventually brought back to the UK by Mike James of PeopleMovers.com. It is expected to be restored for use in the fleet in order to earn its keep. Maybe it will be re-engined in the process? 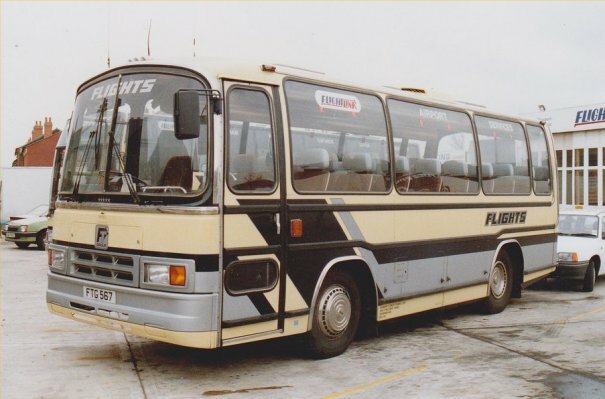 Flights of Birmingham fitted this Plaxton Elite-bodied LHS coach with the front dash from a Plaxton Paramount 3 body giving it a modern look. The LHS was originally registered GHH256N with Yeowart of Whitehaven but was subject to a number of reregistrations while with Flights. I like the use of the rear engine covers on WDM348R here, removed and turned round to create a servery for the cafe for which the VR was being used at Amsterdam-Noord in 2016. 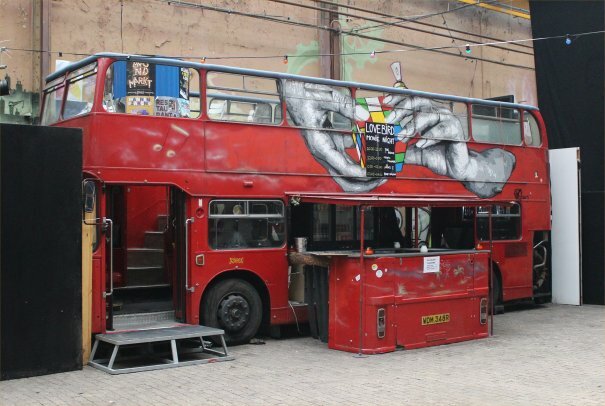 This bus was unusual for an export in having the Leyland 501 engine, and it was active for more than a decade until the engine expired at the docks in 2005 where it stayed until converted as seen in this Frans Angevaare photo taken in August 2016. Eastern National experimented in 1973/4 with the conversion of eight FLFs to one-man operation in the hope of extending the lives of these sturdy reliable workhorses. 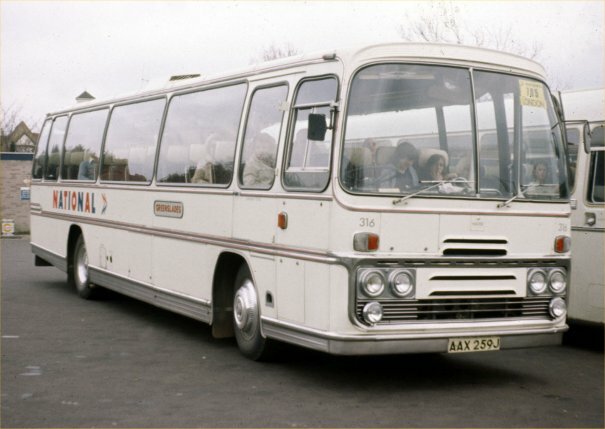 The first conversion in 1973 was WVX525F, followed by six more later in the year (listed here). 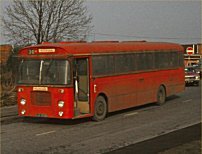 The last, most radical, conversion was 2942 (AVW401F) in 1974 at the same time as being downgraded from coach to bus specification. The only external feature of its conversion visible here is the Pay As You Enter sign to the left of the entrance doors, but internally the changes were extensive (Photos : Richard Delahoy). This view from behind the driver's cab gives some clues as to why even the conversion of 2942 was ultimately unsuccessful. The opening to speak to the driver/hand over your fare was - naturally enough - directly behind the driver causing them to have to swivel round through almost 180 degrees. Understandly this was never a popular turn along with having to slave over the gearbox, but it is a shame because of course OMO condemned the Lodekka to early withdrawal across the country. 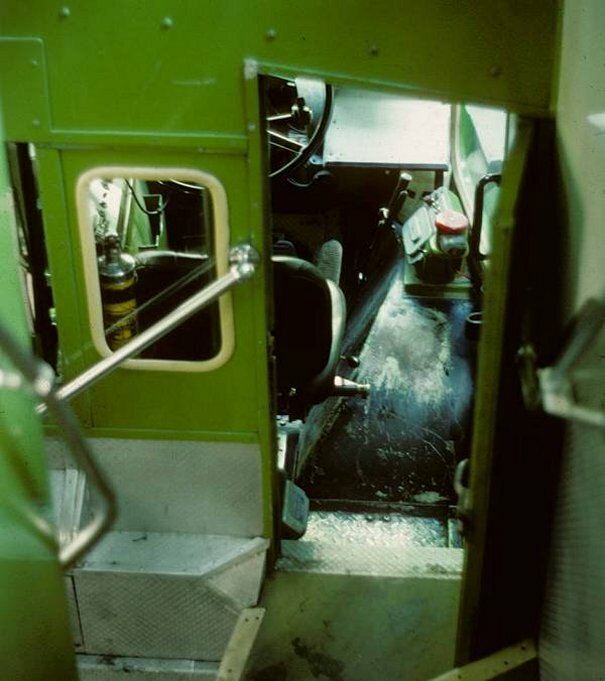 A final view of AVW401F from half way down the stairs (which were reversed during the conversion) clearly showing where the paint has been worn off by drivers clambering over the offside wheelarch to use the entrance into the saloon! 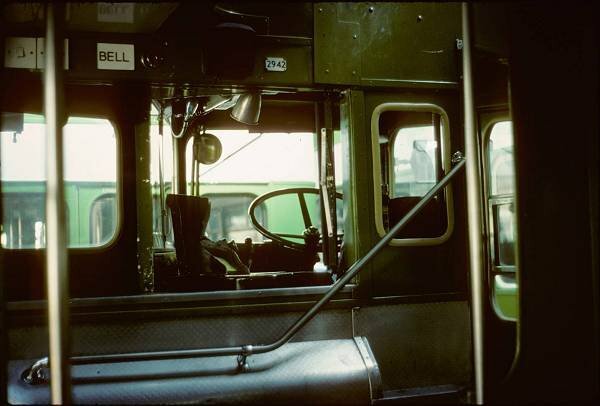 This was also a unique feature of 2942 - in the other conversions the only way into the saloon was to use the external cab door and walk around the outside of the bus. 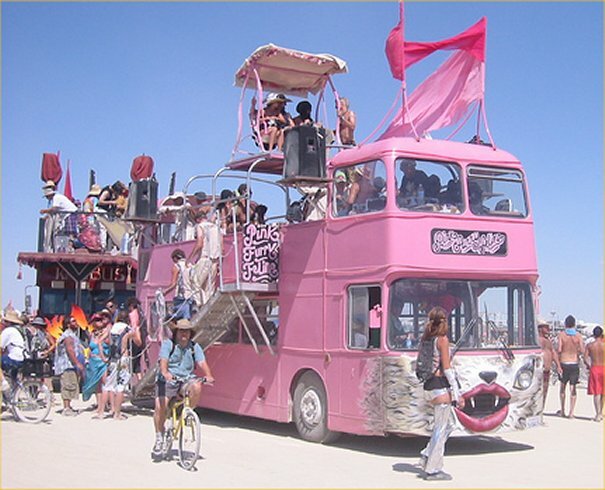 Talk about a bus with nine lives! 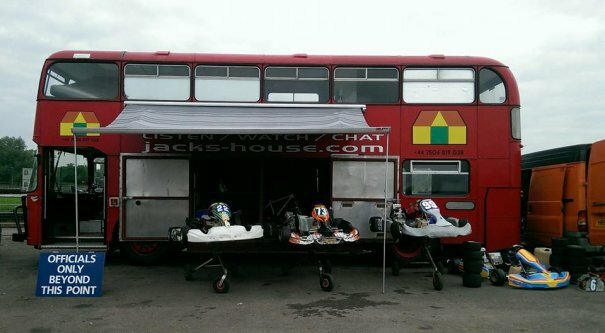 This is EWS742W in June 2014 now converted for use as a racing kart transporter - no easy retirement for this VR having previously been used as a mobile home for trips around Europe and beyond. 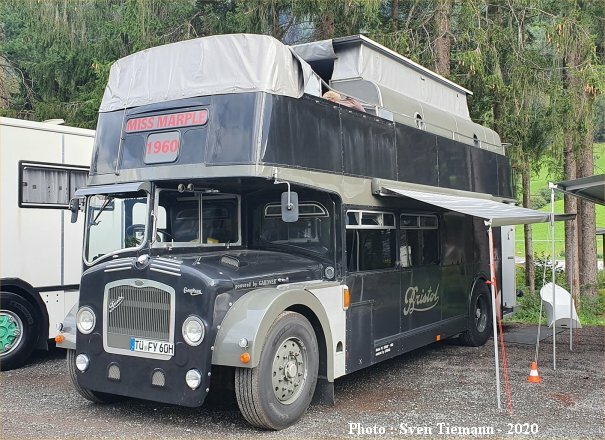 Former Bristol Omnibus 7125 (818SHW) has been hard at work in Switzerland and Germany for many years, but in 2012 it received this unusual modification to allow the front portion of the upper deck roof to be raised on struts for promotional purposes. 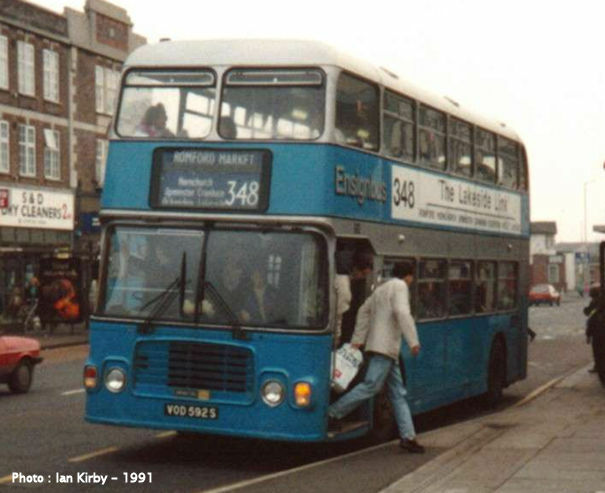 The unusual moulding on the rear panel of HDL412N, which is seen here in service with Merseypride Travel in 1994, betrays the fact that for some years in the early 1990s this bus was used by Hannell (future proprietor of Merseypride) as a mobile carpet showroom. Samples were loaded through this hatch, but once Hannell's attention turned towards PSV operation he reinstalled seating - 37 dual-purpose - and sealed the hatch. The high-mounted registration number was another consequence of this episode in its history. Many thanks to Stephen Day for permission to reproduce his photo here. 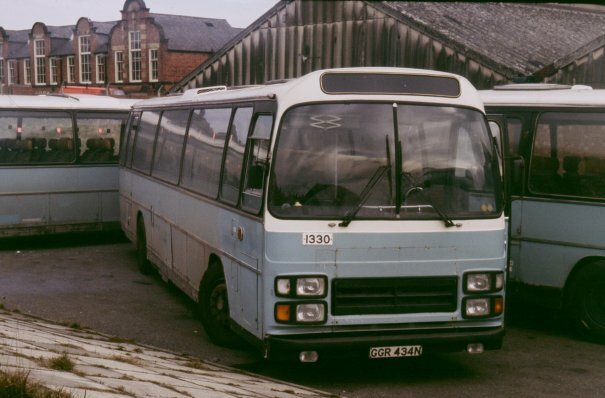 Former Crosville DFB150 (AFM113B) gained this enormous extension to its front bonnet when its original Bristol engine was replaced with a DAF unit during the 1980s. 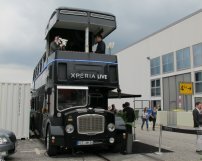 The conversion was obviously successful as the bus was still active in 2014 in its role as a caravan following professional cycle races around Europe. 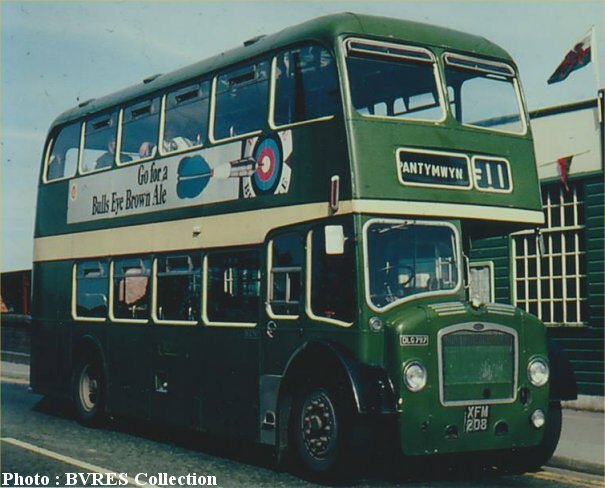 SPM21 seen here was a convertible open-top FS6B (later converted to Gardner 6LX engine) which had a long service career with Brighton, Hove and District and subsequent companies. After final withdrawal in 1990 it found another lease of life with this fabulous mobile home conversion and has been in use with its Swiss owner ever since. 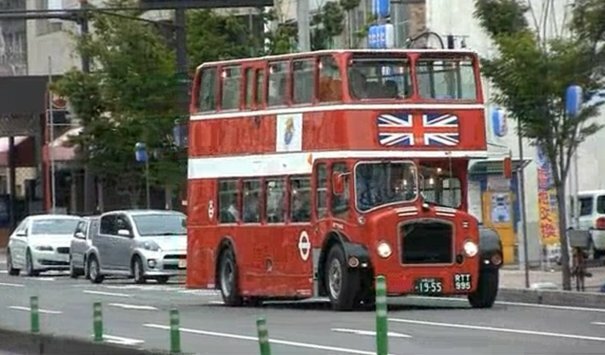 Here we see sister bus to the one opposite - SPM22 had an identical service life to 21 and was also rebuilt as a high quality motor home and exported to Switzerland. It was named "Big Snail" to reflect the fact that it carried a home on its back and not, I hope, its performance on the road! However, the twist in the tale is that it was purchased by Adam Colby (who lives in the Norwich area) in April 2014 and it has now been repatriated to the UK for a further life in preservation. 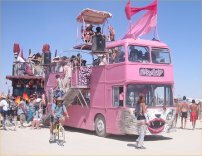 The Burning Man Festival takes place in the Nevada desert every summer and has featured heavily-converted UNW928R for several years. 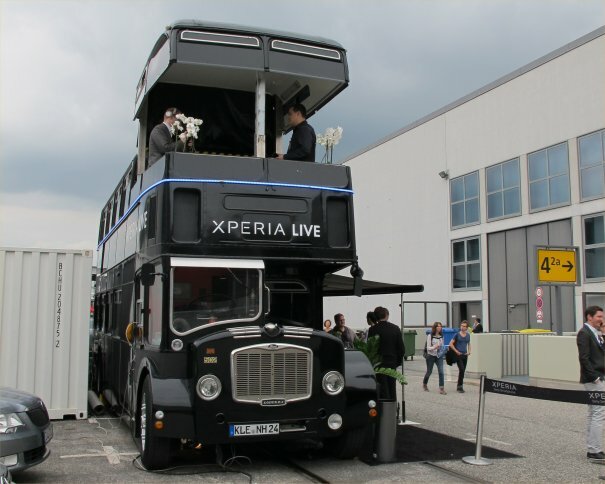 The roof-mounted pedastel must be a first as well as the open staircase on the offside! 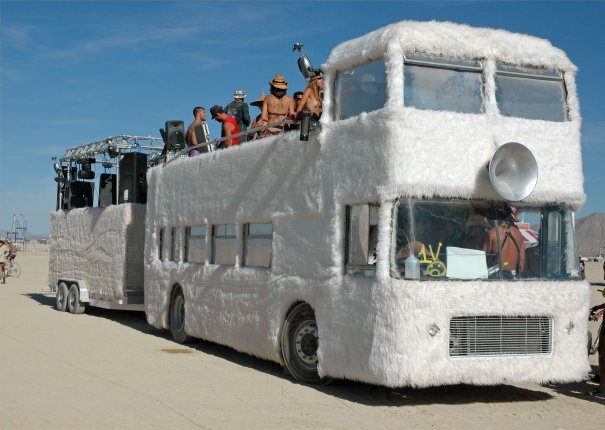 Another VR to feature at the Burning Man festival for several years is LAK938W which has been covered in fur containing thousands of LED lights along with a similarly-treated trailer. It is some sight at night time! 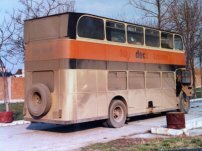 Adrian Flint turned up in Kathmandu in December 1988 expecting to drive a Top Deck Lodekka back to London - little expecting that he would need to rebuild it before he started! 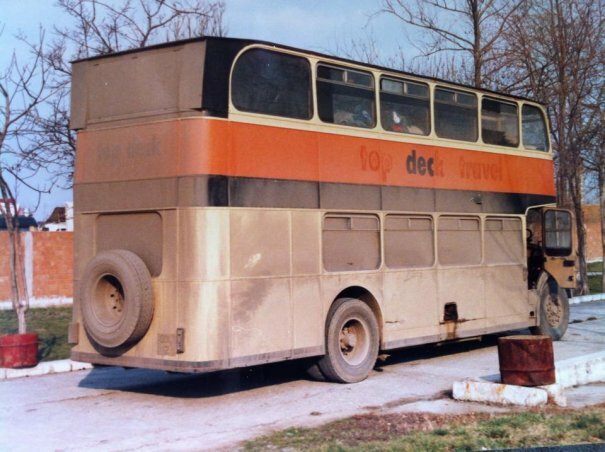 The LD in question was "Slippers" AKA ODL12 which had had its roof ripped off when running empty in India! As can be seen Adrian made a very passable job of it out of available sections of wood and Slippers was rebuilt back in England to see a further four years of service. 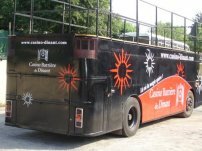 This is former Western National FDV779V with F.A.D.D.S., a party bus company in Tennessee, U.S.A. At first glance I thought this had the most humungous sound system until I realised that those are all cooling units! The extra weight must certainly be testing the wooden inserts on the ECW bodywork which were only designed to carry the lightweight aluminium body panels. Former Southern National/Western National LD6B (RTT995) was converted for use in Japan at Lydney in 2003. 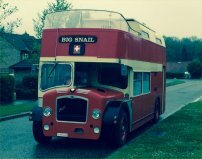 Work included fitting a Gardner engine, lowering of the roof to meet local height restrictions, and consequent conversion to traditional lowbridge layout with sunken offside gangway and four-abreast seating across the width of the bus. A fascinating YouTube clip can be viewed here and a passenger clearly using the sunken gangway can be seen at 2:20.